MSYSA has recently made an announcement to confirm that U.S. Soccer has officially made new changes to the coaching educational pathway with the sole purpose of increasing the number of soccer players ages U6 through U12. For many years, soccer experts determined that many youth coaches in America were over-coaching the game at the younger age groups. Some coaches did not have the knowledge or background needed to coach the beautiful game effectively. Some coaches ignored the notion of "player development" and took the game too seriously by incorporating a philosophy of "making winning a priority at all costs." This winning-centric attitude led many kids to stop playing soccer and possibly choose a different sport. Therefore, three years after introducing a new $25 online F license course, U.S. Soccer has decided to eliminate both the National F and E licenses, and is now offering a free 20-minute online "Introduction to Grassroots" module as the first step into its coaching schools. To get started, you simply must create an account with the Digital Coaching Center (DCC). If you already have a DCC account, simply log in to complete the online Grassroots module. 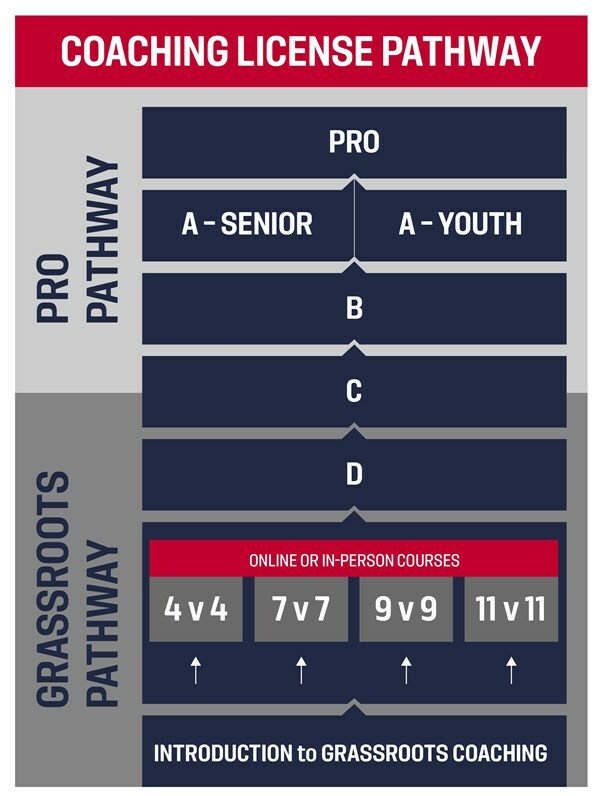 After completing the "Introduction to Grassroots" module, coaches will be eligible for four online and four in-person "Grassroots Pathway" courses: 4v4, 7v7, 9v9 and 11v11. These courses are replacing the F and E licenses. Each course will cost $25. The fee charged by the Maryland State Youth Soccer Association for in-person courses will be determined in the near future. Once you complete every course, you will receive a U.S. Soccer Grassroots Coaching License. Candidates who complete a minimum of two in-person courses (one of which must be the 11v11 course) and one online course will be eligible to take the new National D license course. - If you currently hold an E license: you advance to the new National D license by completing the cost-free Introduction to Grassroots Coaching module. - If you currently hold an F license: you advance to the National D license by completing the Introduction to Grassroots Coaching module, the 11v11 in-person course, and one additional in-person grassroots course, the 4v4, 7v7 or 9v9. - For youth coaches who wish to coach travel soccer in Maryland, you will be required to hold a Grassroots License (either a 7v7 or 11v11 grassroots license). We will announce more details next month. - My goal is to host the National C-Course twice per year, which will continue developing and increasing the level of coaching throughout our state. We currently have a few spaces available for the March Maryland C-Course. Log into your DCC account to register today! We will launch the new Grassroots and D-Courses during the summer of 2018. More announcements will be released by the end of February.